a) As we saw in the Begin and Rabin Centers, sophisticated headsets are now handed out to visitors, providing translations, movie commentary when you walk in front of a film etc. At Yad Vashem, the tour guide wears a mike and the headsets are mainly designed to keep the visitor focused on the guide’s explanation of the different aspects of the exhibit. This was most valuable for our students, whose concentration was greatly enhanced by having a “live” audio feed into the ears, no matter where they were with the group. It allowed kids to wander off a few feet to look at some other aspect of the museum, but to always be connected to the main group. Acoustics were not a problem and other guides taking their clients through the museum did not interfere with our tour. The place was packed! b) Secondly, our tour guide, Jonathan, a Welsh Jew who came on Aliyah, was a tremendous educator! He was animated, excited, knowledgeable – changed his tone and pace depending on what he was describing. Since he knows five languages, he could generate a very realistic atmosphere by reading some of the Nazi newspapers, textbooks and posters with an authentic German accent and inflection! We thanked him afterwards for such a professional presentation. Kids loved the structure and meaning he gave to the events and participated enthusiastically in the discussions throughout Yad Vashem. Tonight, after dinner, I will be speaking with the students about the conclusions we have to draw from the Holocaust regarding our Jewish commitment. What does it mean to be a continuation of our people? For those of you who have been following this blog, tonight will be my last blog entry, as tomorrow – until Shabbat – will be a packed day, and Motza’ey Shabbat we will be cleaning up, packing and going to bed for a 5:30 am wake-up ……….preparing to wing our way back to Seattle! I just came back with the group from “the MidRechov” in Jerusalem, where we frankly…..hung out! I haven’t done this for years — 30, to be exact, but it took me down memory lane. SHA treated all the students to a sweet treat at “Katzefet” – known for its ice cream and frozen yogurt. Because we had chicken for dinner, we sought out a pareve treat, and ended up choosing an Israeli form of Slurpee. Within a couple of minutes, we were all experiencing different degrees of S.B.F. (“Simultaneous Brain Freeze”) since this drink was REALLY cold! We drove through the Galil earlier today, from the Kinar to Tel Aviv, where we spent two hours at Park HaYarkon – otherwise known as “Ganei Yehoshua”. After a little “monkey bars” activity, we all headed out to the paddleboats on the Yarkon River. We had a great time, did a lot of “bumping” between our boats and got some tremendous exercise for our legs and feet! It was probably a miscalculation, but we agreed to have the shwarma-in-pita lunch dropped off at our next location: Independence Hall http://www.eretzmuseum.org.il/main/site/index.php3?page=75 in downtown Tel Aviv. Aside from being hungry until we arrived at the Hall, we couldn’t eat the lunch right away because the museum staff said it was against the rules to eat inside….so I ran to a nearby Kiosk and purchase a small chocolate bar for everyone to tide them over….None of the students were particularly impressed with the presentation of the Israeli woman who was trying to give us a sense of what it was like to be sitting in that same room on Erev Shabbat, May 14, 1948, at 4 pm, as Ben Gurion announced the establishment of the State of Israel. But the experience of being in that room – left with the same furniture it had on that day, and with the famous adornment of two long flags of Israel draped on the wall, on either side of portrait of Theodore Herzl — was impressive. Little plastic cups were handed out for Netilat Yadayim, and the students then dined on those shwarma sandwiches on the boulevard in front of Independence Hall. Our driver, Chaim, fetched us at about 3:30 and delivered us to our next stop: the new Rabin Center. This wonderful educational facility uses a technology similar to that of the Begin Museum, but is on a much larger scale, with additional clever technologies for covering the life of Rabin. Alongside the main path through the museum, which chronicles Rabin’s career as a military man and then politician, runs a series of complex short films, displays, etc that chronicles what was happening in the world, and in Israel in particular, during that juncture of Rabin’s life. We only spent an hour or so in the Center, but I would like to personally go back and spend more like 2-3 hours. Surprisingly, the Center was able to remain apolitical as well as not “obsessing” with the tragic murder of Rabin in November 1995. Chaim came to whisk us back to Jerusalem to our “Old Stomping Ground”, the Sefardic Center in the Old City, where we ate dinner, davened mincha, and left for Ben Yehuda. Trek to Rechavia for Lunch with the Ginsburgs once again! Up at 7 am today, most of us arrived at minyan within a couple of minutes of the official 7:15 starting time (!). We dined on sundry dairy delicacies for breakfast until 8:15 or so, and managed to get everyone on the bus by 8:45. Off we went to the ancient Holy Galilee city of Tzfat(also known as Safed). Our walking tour took us through the artist’s quarter where I was tempted to purchase a new backgammon set, but held off until we return to the Old City on Friday, where I think I can purchase it for a much lower price…or at least haggle a bit… Many students saw this as a perfect opportunity to buy gifts for their friends and family back home. The candle store in Tzfat which supplied our 8th graders with their Chanukah and Havdalah candles was our next stop. So many creative candles to choose from, but…. 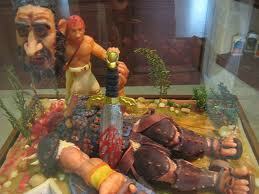 most of us ended up admiring some creative candles, like the David slaying Goliath candle scene (see picture below)- six months in the making – or Noah’s Ark, featuring some familiar animal characters, like Tigger from Winnie the Pooh. We spent a short time in each of three famous synagogues – The Ari Synagogue, Rav Yosef Caro’s Synagoguge, and the Mari Abuhav Synagogue. At this time of year, there are many “Birthright” groups touring the country, so quarters were somewhat cramped. 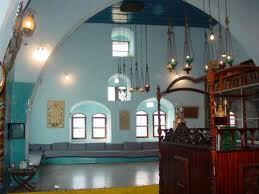 What characterized each one of these shuls was the ornate design and the prominent Bimah in the center of the synagogue. Past a new Braslov yeshiva and shul, we wound our way down to the historic Tzfat cemetery, where we visited the grave of Rav Yosef Karo. The plaque there lists Rav Karo’s accomplishments: although he is most noted for his “Shulchan Aruch” (Code of Jewish Law), his magnum opus was the Beit Yosef, a commentary on Rav Ya’akov Ben Asher’s Arba’a Turim. In the Beit Yosef, Rav Karo cites all of the “sugyot”/sections of the Gemara that serve as the basis for ruling of the Arba’a Turim, and then explains the various interpretations of the Rishonim (medieval commentators) on those sections of Talmud. His aim: to explain the basis of each ruling of Rav Ya’akov Ben Asher. The Shulchan Aruch, then, is really the condensed version of his conclusions in the Beit Yosef. From the grave of the Beit Yosef, we were also able to see the grave of R. Shlomo Alkabetz. I had students snap a photo of R. Alkabetz’s kever to show SHA 7th grade student Raphael Alcabes; I had told Raphael that his name comes from the name of a famous Sephardic rabbi. We also passed by the grave of Rav Moshe Cordovero (author of Tomer Devora) and saw, from a distance, the burial place of Rav Moshe Alshich. At day’s end, we glided along the Kinneret coastline of Tiveria (Tiberias) and wound our way down to the burial site of the Rambam, Rav Moshe Ben Maimon, and his father, Rav Maimon. Along with a couple of students, I recited the special Tefillah that one should recite at the grave of the Rambam, author of the monumental work, Mishne Torah, Sefer Hamitzvot and Moreh Nevuchim (Guide for the Perplexed). There is a strong tradition to pray at the gravesites of Tzaddikim – not that we are G-d forbid – praying to them, but B’zchutam – in their merit – we are praying to Hashem to answer our Tefillot. This area is somewhat commercialized, with kiosks selling memorabilia, etc. Several of the students became enamored with a black kitten that had nestled next to one of the stores. Ruth asked if we could take it home. I had to answer in the negative..
As a group, we proceeded to the donkey rides. Each person had a partner: one of us was to ride half way, one to lead the donkey. Half way through, we could switch roles. Amir explained to us how to mount the donkey, how to get it to start walking and how to get it to stop. To get it to start walking, we were to say (with a guttural Jewish “ch” sound) : “Che Che Che” and to get it to stop, we were to say (softly) “Esh, Esh”. It was fun, I first led Noam’s donkey, then he led mine. Half way through the trail, we stopped and Amir showed us the house in Tzippori of Rebbe Yehuda Hanasi (editor of the Mishna). Next up we gathered under a large area shaded with bamboo, and Amir took us through each of the steps leading to the kneading and baking of pita bread. We had seen aspects of this process earlier in the trip, but Amir’s description was filled with much detail, humor, and most importantly – halacha. He explained that since ox is a much stronger beast, a farmer who tries to get more “horsepower” on his plowing is forbidden from doing so due to the pain or even likely death of a donkey thrown into this situation. After all, you are getting his free labor – let him eat while he’s working! Behind the covered demonstration area was a hot (what seemed like an) upside-down pot and some fresh dough balls. Amir described the mitzvah of separating “Challah” from a certain amount of dough prior to baking the bread, and then gave us each a dough ball, which like pizza chefs, we were encouraged to stretch out into the shape of a large pancake. A young man in charge of the cooking showed us where to place each of our raw pitas, and flipped them over when each side was done. Each pita took about 15-20 seconds per side to cook! Netilat Yadayim facilities were available on location. Everyone washed, recited Hamotzi, then gently dripped an olive oil/zatar dressing on the top of his or her pita. Then came lunch: We followed Amir to another covered area with tiny tables, each surrounded by four stools. It was now time for our Tannaitic-era lunch! “It all goes in the pita!” Amir cried. Well, I understood what that meant when it came to the Humus, Tehina and Israeli salad…..but Amir meant for us to also put the next course in our pitas: generous helpings of beef kabobs, rice, and barbequed chicken fingers ! Cold pitchers of water with a slice of lemon was our beverage. None of us left there hungry, and kavana for Birkat Hamazon was at an all-time high! As we removed our ancient robes and headdress, Amir offered us fresh dates and a pot of herbal tea. What a perfect desert! Being the rabbi on staff, I told students that we had to check the dates for bugs, as occasionally, they become infested. To set the tone, I opened up my date. Parents, I found no less than 20 dead ants inside! The picture will hopefully appear on the Oranim blog within the day. Though it wasn’t planned, this turned into an opportunity to remind everyone of the importance of fruit and vegetables that often contain bugs, like dates and figs, Romaine lettuce, cauliflower, broccoli and the like. You can see a short film about Kfar Kedem by clicking on http://www.k-k.co.il/index.php?option=com_content&view=article&id=9&Itemid=15&lang=us The relevant section starts 1:30 into the film… An early return to the Kinar Hotel (around 4 pm) is giving us a time to recreate, shower, rest – and make it to Mincha by 6:30..followed by dinner and Ma’ariv. Tomorrow, we bid farewell to the Golan and head to Tel Aviv, with Thursday night back in Jerusalem’s OldCity! 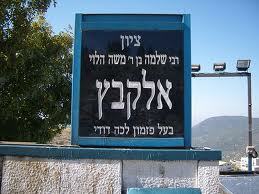 Following our “in-house” Shacharit today at the hotel, we set off to Har Bental (Mt. Bental) in the northern Golan. See the location on the map by clicking http://www.eyeonisrael.com/mount-bental.html From the top of the lookout, we could clearly see Syria; this position clearly gives one a perspective on what it would mean to “return the Golan Heights” to Syria and helps one internalize the security threat involved. Since Israel conquered, then defended, the Golan in ’67 and ’73, the Golan Heights Winery http://www.golanwines.co.il/default_eng.asp has cultivated the land below Mt. Bental, a few short kilometers from the border with Syria. It’s really an aesthetically beautiful stretch of land! While on Har Bental, Ari took the opportunity to tell us the story of Israeli spy Eli Cohen, which can be found also on a website that his brother, Maurice developed: http://www.elicohen.org/ — and how Eli Cohen’s intelligence information was instrumental in Israel’s 6 Day War victory. We had a chance to walk through the Syrian-built bunkers atop Har Bental. Back on the bus, we traveled to עמק הבכא – the Valley of Crying/Tears, where one of the key battles of the 1973 Yom Kippur War took place. It is a memorial park; on location are not only plaques in memory of those dozens of soldiers who lost their lives there, but several of the destroyed Israeli tanks stranded there. I found a video clip on YouTube that gives a mini-tour of the Valley of Tears memorial, as well as giving a clear picture of the proximity of where were standing today – to Syria. See http://www.youtube.com/watch?v=gAnOF7Wjdbc After hearing some details of this dramatic story, we traveled across the way to Kibbutz El Rom and saw a wonderful 25-minute film documentary on the battle, featuring Commander Avigdor Kahalani. A key aspect of the story is that the Israeli tank corps was ill-equipped to fight at night, while the Syrian tanks had advanced infra-red systems that facilitated night fighting. In addition, we were far outnumbered. By the final stages of the battle, Israel, led by Kahalani, had only 4 tanks, against over 100 Syrian tanks. Somehow, the Israelis’ tenacity – and, as our bus driver Chaim explained, a lot of “Mazal” triggered the Syrian retreat. In the intense final fire, Kahalani and his soldiers wiped out about 70 Syrian tanks….On the bus to Katzrin, I reminded the students of the “Al Hanisim” we recite on Chanukah, of how G-d gave over רבים ביד מעטים – many into the hands of the few. Here is a modern day story of the same! What Chaim called “mazal”, I call miraculous: The Syrians, startled by Israel’s apparent failure to put up much of a fight, were convinced that behind Kahalani’s 4 remaining tanks, were another several tank columns. This belief itself – that Israel had something up its sleeve – combined with the determination of our soldiers, brought about the Syrian retreat, and “bought time” for Israel, 24 hrs to be exact, to call up its reservists! From there, we traveled to an olive-product factory a few miles away http://www.golanoliveoil.com/Default.asp and some of us purchased an olive scrub that apparently obliterates acne and is in general great for the skin…. Then it was Pizza time at “Pizza Pitzutz” – along with Caesar Salad, spaghetti and cold drinks! Showers, Mincha, dinner back at the Kinar and Ma’ariv ended the day. I had made an error yesterday, saying that today we would be in Tsfat and Tiberias – that is Wednesday’s plan! If yesterday’s theme was “hands-on”, Monday expanded to a “bodies-on” adventure. We started the day with a 6 am wake-up from Midreshet b’Yachad in Yerucham – and without having breakfast (some of us had a Turkish coffee, I admit!) we boarded the bus for Massada. We arrived there about 7:15 am and trekked up the short path (thank goodness) to the top, where we freshened up and invested ourselves in Tefillat Shacharit, along with Monday’s Kriat haTorah, Parshat Bamidbar. Thanks to our tour guide, Ari Singer, a Sefer Torah was set aside for us for our minyan. The trip uphill and the Tefillah (in the hot morning sun) was physically taxing, and the kids passed with flying colors. Ari then took us to various key points on the top of this magnificent desert fortress, including Herod’s desert palace – we stood on the third level; his public bathhouse…. We also walked through the fortress’ food storehouses and had a terrific view of two Roman army camps. See the outlined section of this Roman Army Camp? Now, when we got to the bottom, most of us purchased ice cream on a stick (“Magnum”) along with a Gatorade…. Then it was on the bus again for about an hour (plus) ride to the Dead Sea. We stopped at the Tzel Harim hotel and had a filling (meat again!) lunch…A half hour later, we were at separate (men and women) beaches so we could experience the Dead Sea in accordance with halacha! (This got me thinking about how Israeli business responds to the demographic growth of its religious communities, and the economic benefit of accommodating their halachic needs..) After swimming, floating etc for a half hour or so, many of our boys decided they wanted to purchase the special gooey mud, let it dry on their bodies, and then enter the Sea again, sealed with black mud. I must confess that I did not personally indulge, but I did help smear mud on some backs…..Floating on my back in the warm sun of ים המלח was super relaxing and one of life’s simple pleasures…until, of course, I read the newspaper…only to discover that Israel will be ….giving up the Dead Sea in a final peace deal? …..Back on the bus for what turned out to be a three hour ride to the Golan Heights. We had to make several stops along the way. By 7 pm, we had arrived at the Kinar Hotel, where we davened Mincha, showered, and enjoyed yet another meat dinner, featuring a Smorg of roast beef, chicken, soup, rice, potatoes, salads, capped off with chocolate mousse, jellow, cakes, brownies and coffee…..Maariv was at 8:45 and lights out are just about now! Tomorrow: Tzfat, Tiberias and the graves of the Tzaddikim, followed by kayaking! "Back to the '67 borders? Hmm..."
First of all, I want to thank all of you who are devotedly reading this blog – I have seen all of your comments and emails and really appreciate the support on this trip. It has been a truly fantastic adventure so far and the communication back and forth from Seattle to Jerusalem and back through cyberspace – has enhanced our experience! The kids finally have wireless internet available here and are reading the blog and your comments, too. I am sorry I can’t respond to each one of you individually, but — I’ve got my hands full! Today, Sunday, was a real “hands on” day. 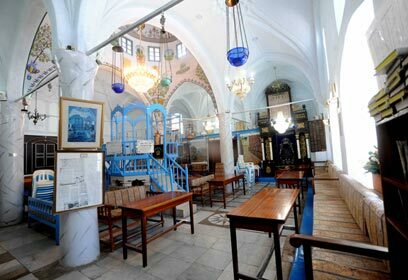 We davened in the Churva Synagogue of the Old City, had breakfast, packed up and went to the Temple Mount Sifting Project http://templemount.wordpress.com/ . When you go to their blog, there are YouTube videos that capture the nature of today’s outing. The background is: in 1999, the Muslim Waqf built a new underground mosque on the Temple Mount. To do this, they (illegally) cleared away tons of debris, materials that could provide new information on the activities on Har Habayit since the destruction of the Second Temple. Israeli archeologists and activists followed the trucks carrying the debris and discovered that it was being dumped in the Kidron Valley in Jerusalem. They soon set up the project, which encourages volunteers to come sift through debris to help with research. Moran, our guide, spoke a very good English, providing us with a half hour introduction, including explaining to us what we would be looking for. In “chevrutot” we spent an hour + sifting through debris. All of us found a lot of pottery – but Noah G. and Shaya found a large piece of pottery from the time of the Crusades, and I discovered a (building) nail from the Roman period, almost 2000 years ago! From there, we reboarded our tour bus and headed to “Center One” in Jerusalem for a delectable (paid for by Oranim, but we left the tip!) meal with a choice of Hamburger, Shnitzel or Me’urav Yerushalmi Platter. Now, Me’urav Yerushalmi is usually a collection of sundry sauteed organs such as hearts, livers, spleens etc. You can probably guess who (!) several of our students ordered it….Thankfully, it only contained spleen and chicken this time …..
We then alighted once again and headed for an hour or so to “Leket Yisrael” http://www.leket.org.il/english/text/328.aspx where for an hour and a half – we picked potatoes along with a family that recently made Aliyah to Modi’in. Together, over 90 minutes, we picked 2100 Kilos of potatoes, enough for 700 needy families for one week! Please send your Yasher Koach/Chazak U’Baruch to your son and daughter for this praiseworthy act of Gemilut Chassadim! Former Seattlelite Lori Goldberg and her daughter Rochelle came out to meet us and we were able to take a group picture! An hour and a half bus ride had most of the kids on their Ipods listening to music (It’s Lag Ba’omer!) and brought us to the Negev development town of Yerucham, where the kids unpacked, played basketball, showered, had a delicious dinner of Shnitzel (for some, the second time today!) French Fries, bourekas, salad, topped off by an ארטיק/popsicle — and Mincha. We will be starting Ma’ariv in 5 minutes, at 8:15 pm. Early to bed, early to rise tomorrow (Monday) morning as we head for Massada and then north to the Kinar Hotel. Feel free to stay in touch by phone, email or this blog…More to come tomorrow night! We got up at 8:30 and were able to get down to the Kotel by about 9 am. A very dynamic Sephardic man in his late 50’s led an inspiring Tefillah… but the best part of the morning was the Kriat Hatorah by Rabbi Yakov Adess. He is a famous Talmid Chacham living in Jerusalem, a prolific writer, a Tzadik – in short, a real “Man of G-d”. He spends many hours a day at the Kotel learning and praying. Anyhow, this week’s parsha was Bechukotai, the last portion in the book of Vayikra. It starts with an account of what will happen to our people when we observe the mitzvot, then the terrible tragedies that will befall us if we don’t. It then pledges that when we do teshuva when in our exile, G-d will “remember” the covenant he struck with Avraham Yitzchak and Ya’akov and will deliver us from the exile. When Rabbi Adess began the parsha, his eyes glued to the Sefer Torah, he was wearing a broad smile; the very image of those great blessings awaiting us delighted him. When, however, he reached the klalot/curses, he tried to race through them, reading them softer (as is Jewish custom) but paused on at least three occasions….and cried for about 5 -10 seconds each time! Maybe the Holocaust entered his mind, maybe the Spanish Inquisition, perhaps the destruction of the Temples. He cried like a baby. The boys and I were understandably startled by this; we’d never seen somebody relate emotionally to the Kri’at HaTorah in this way. When the rabbi finally reached the point where the Torah promises that Hashem will accept our teshuva and will recall the covenant, he paused, savored the moment — and began to cry tears of joy. …topped off with fresh melon, cakes, cookies, coffee or tea for dessert. At 4 pm, we were pointed in the direction of Katamon, and another 20 minute walk to the Potters (Dr. and Mrs. and family) The Ba’alat Habayit was Jeremy Voss’s aunt, Naomi Voss. She prepared a wonderful Seudah Shlishit for us in her courtyard and visited with the kids. I gave an interactive 20 minute mini-shiur on Sefirat Ha’omer and Rabbi Akiva’s students. Later, I visited with Dr. Potter and the Potter’s guests, a family fromVancouver also, who came on Aliyah several years ago and who now live up north in the Galil. St. Simone Park was nearby, so we walked with the kids to the park for about 45 minutes. Hundreds of people were there with their families and pets. A few of our basketball-inclined students shot some hoops…. For Mincha, we attended the famous Katamon “Shteiblach” – a shul that had minyanim around the clock. It was packed, warm and friendly…. Arriving back in the Old City, we freshened up, made Havadalah, and had our own private Ma’ariv/Arvit minyan. The evening’s festivities began with Jeremy Voss and Hillel Meyers on guitar, and Hillel, his brother Moshe, and myself on vocals. A selection of songs entertained us for close to an hour. But the unquestionable highlight of the evening was the “beat-boxing” antics of Hillel Meyers! Noah Z, not known for expressing excessive doses of emotion, exclaimed, “That’s crazy!”. Tzur was seen clapping and tapping his feet. At 10:45, I returned with my sons to their yeshiva to do laundry and visited with my daughter and her husband for a short while, during which time our tour guide Ari took the whole group around the Old City for Lag Ba’omer bonfires. I came back to the hostel at 2:15 am Sunday morning Jerusalem time; it’s now 3 and wake-up time is 7 ! Have a great Sunday – Shavua Tov! We began the day at גבעת התחמושת – Ammunition Hill – inJerusalem, which is just at the corner of Sderot Levi Eshkol and Route #1. The morning’s theme was the Six Day War. Many do not know that Route 1, separating the Ma’a lot Dafna neighborhood and the Muslim area of the Old City– was the border between Israel and Jordan after the 1948 War. Ammunition Hill is the site of one of the more important battles in the Liberation of Jerusalem in 1967. In 2008, a Jewish family in LA funded the production of a documentary of the military side of the Six Day War’s battle forJerusalem. It is truly excellent – incorporating detailed footage and narrative with a three dimensional floor map of the city. At certain points, the film “freezes” – and a combination of lasers and other special effects are projected onto this floor-map, creatively animating the various stages of the fight for Jerusalem. We then went to the actual battle site, and stressed to the kids the need for decorum, since many Jewish people lost their lives there on behalf of our people. We wound our way through the trenches – Noam was challenged! – and took a picture atop a tank. Next up was the Gush Katif Museum downtown. Frankly, parents, this experience was not so great. A sweet young Israeli woman, whose family was evicted from Gush Katif back in 2005, was the tour guide. Her English was choppy and many kids commented that there were too many personal experiences in her presentation. I think it would have been much more effective if someone objective could have given us an overview of the events leading up to it. There were two films, one fascinating one that filmed images of the evacuation, and how even soldiers ordered to expel residents from their homes and synagogues were crying……and one, not so well done…but, what can you do? It was an experience! While in the area, we spent about 45 minutes in Shuk Machane Yehuda, where we first stopped at Marzipan for some sticky, delicious delicacies and drinks…….We then walked through the shuk and experienced the “electricity” of this legendary outdoor marketplace. By 2:15 we had all gathered on Ben Yehuda Streetat Moshiko Restaurant. Hands down, Shwarma was the most popular item on the menu…some of us were a little less ambitious, and ordered one in a regular pita, others more adventurous, who went for the “Lafa”…. Erev Shabbat ended with showers and Shabbat clothes….then: down to the Kotel for Mincha and Kabbalat Shabbat! There must have been 1,500 people at the Kotel, all davening with their special groups. Chassidim in their Shtreimels and Spodiks were at the left front section of the Kotel, a Sefardic group of teenage boys gathered in the back right section, and then about 50 soldiers in uniform started a minyan behind us! We were literally surrounded by a sampling of “the Jewish people”. It was very hard to hear, but I looked around at our boys (girls were in the women’s section of course) and found them gazing around at this phenomenal, truly historic scene! One main theme I plan to bring out at the end of our trip here is the feeling that it’s normative to be Jewish…specifically, to be an observant Jew. The kids see around them Jews of all stripes, and I sense that this has given them a new context within which to see their own Jewishness. Dinner was delicious, with spirit added by my sons, Moshe Chaim and Hillel Meyers, who joined us for the meal. Lights out were 11:30. Tour the bonfires of Yerushalayim on Lag Ba’omer night! We’re back at the youth hostel on a “chill break”, as we shower and freshen up for Mincha at the Kotel and an evening at the Malha Mall. After breakfast, we headed to the development town of Kiryat Malachi. I actually did not know what awaited us there. A little bit of a “glitch” that turned out to be quite a nice experience. The event was billed as an opportunity to spend some time with kids their own age and share mutual interests. What class did host us?……. At first, this was awkward, especially the ice-breaker activity…but soon after the activity was over, our kids and theirs naturally separated into two groups and talked for over an hour. SHA 8th graders were actually heard speaking Hebrew in order to communicate information about themselves to their Israeli counterparts. After a short 10-minute break, we were treated to a delicious Baguette and Shnitzel lunch. The Kiryat Melachi 8th graders made beautiful handmade souvenir key-chains with Tefillat Haderech on the back. After stopping to purchase more water (drinking a lot of that lately!) we headed to Sataf http://www.gemsinisrael.com/e_article000006236.htm for a beautiful hike through the hills of Judea, about 10 minutes outside of Jerusalem. There we saw archeological evidence of the terraced farmed used in ancient times to maximize the use of water for farming. Our Tiyul finished at the bottom of the hill as we were picked up by Chaim, our bus driver who brought us back to the OldCity. Today was an exhilarating but exhausting day for the 8th Graders (and their chaperone!) Probably THE major highlight was our 25 minute jaunt through an underground water cavern, Warren’s Shaft http://en.wikipedia.org/wiki/Warren’s_Shaft dating back 2700 years to the time of Chizkiyahu Hamelech. Knowing what lay in store for us, we put on special “water shoes” and appropriate battle gear; Our guide, Ari and two students, carrying flashlights, helped navigate our way through the tunnel. It was very challenging negotiating the various twists, turns plus changes of width and height in the tunnel. But we did it! Our afternoon was spent in the newly excavated sections of the City of David, the southern wall excavations and the Kotel Tunnels. 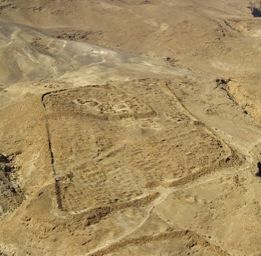 The southern wall excavations http://www.mountofolives.co.il/eng/panorama.aspx?index=8 gave a very clear picture of what access to the Beit Hamikdash was like during theSecondTemple period. We learned of and saw Robinson’s Arch – which is essentially a clear protrusion from the upper part of the Western Wall, outside the immediate “kotel area”. The arch is the remnant of a giant arched gate by which Jews – especially during Pesach, Shavuot and Succot, entered the area of the Beit Hamikdash to bring their Korbanot and celebrate the Chag. Around the south side of the wall around the Temple Mount, we saw the remnants of two similar arches that served as the main entrances to the Temple Mount from the southern neighborhoods of the City ofDavid. 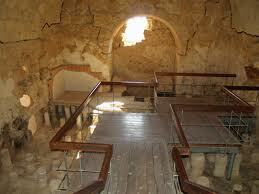 A few hundred feet away was an intricate series of Mikva’ot/ritual baths that were used by those who had to purify themselves before going up to worship Hashem in theTemple. The day started off with a “gripping” visit to the Menachem Begin Heritage Center. http://www.begincenter.org.il/en/ In the period of just over an a hour, we followed Menachem Begin’s life from his leadership in the Irgun, through his historical upset victory in 1977, through the trials and tribulations of Milchmet Shalom Hagalil in 1981 to his sad demise. The museum curators did a fantastic job of keeping our attention through a variety of super-creative 180 degree – movies, special effects, and real-feel visits to Begin’s Tel Aviv apartment and rallies. I have a lot of other thoughts on this part of the program; our group meets tonight after Ma’ariv to discuss the day’s highlights. On Rivy’s recommendation, I am going to be conducting one of these pow-wows nightly to help the kids consolidate their experiences and get honest feedback about the program. The reasons for the delay are multifold, but better late than never, I guess! The kids were very well behaved throughout the trip, which was not a simple trip. Giselle Greisman was a big help, with her three trays of croissants to satisfy the hunger of the masses. We left about 45 minutes late from JFK, and once landing in Israel, had to wait quite a long time to get the last bag – Shaya’s – from the carousel. We then traveled as a group to Neot Kedumim, where we had an enchanting tour of Biblical and Talmudic fauna, capped off by tree planting. The mini-tiyul had a strong message of the importance of not taking food for granted. Hands-on activities gave the students a chance to understand how much work went into plowing, threshing and grinding bread. We saw the beautiful “Moriah”/sage-like plant which grows only in Israel, and in the shape of the Menorah in the Beit Hamikdash. Given the fact that the kids were participating straight, without any rest – they were just terrific. We arrived in the Old City after six, got our rooms, some of us quickly showered, and ran to Mincha in the Jewish Quarter. After a hearty dinner of roast beef, we had a brief meeting setting up tomorrow’s schedule and the kids went to bed. Due to no internet connection in the building, I am sitting outside on a stone staircase in the Jewish Quarter writing you now. More updates to come on Wednesday! Thank you Rabbi Meyers! I enjoyed reading every word! It was great to see the tree planting because I visualized tiny, tiny plants but it was real tree planting. I did not hear about the kotel, did you run out of time? Maybe tomorrow? I just told Miriam to check out your blog! We are hanging on to every word. Please say hello to Albert and Company for me!! Oh, can you keep us posted on the weather? I’d love to enjoy your sunshine from afar! They were pretty small plants..but it was still fun. Kotel is tomorrow am, no time today. Weather during the day time is close to 80 C – and sunny! Hello 8th Grade Class!!! This is Grandpa Albert writing to you from SHA on Grandparent’s Day! I read Rabbi Meyer’s blog and am so excited to hear about all of the things you are seeing and learning about. I was in the Hezekiel Tunnels two years ago and i know exactly what you are describing. I am so excited and happy for all of you. i will continue to check the blog and the Oranim websit for photos and updates. PS Albert, I am so happy for you! Mom said you put her note in the kotel thanking Hashem for your good heath! Baruch Hashem! Although I’ve been to Israel a few times, and probably have visited the sites you’re scheduled to visit, I can just imagine the excitement of all the students as they visit Eretz Akodesh. Please give them all my best. Hazzan Uvaruch to you, to Ari Singer and to all the students. I wish I was there with you. Hey 8th Graders!! Me again. I just read about your visit with the group in Kiryat Malachi. I look forward to hearing first hand about that experience when you return. While I write this you are at the mall and I have a feeling it will be a good time. I am wondering if this is THE mall where the food court has dairy on one side and meat on the other half. If so, I know Albert will take his brother Jacob’s advice to heart and order from the meat side. (Jacob’s advice was “Albert, eat meat every single meal in Israel!” I am going to check out the Oranim sight to see if they posted pictures. I am eagerly awaiting current pictures! Enjoy every moment! Hello Albert and Friends!! We are so very excited that you are in Israel! Your itinerary seems so exciting and educational and I am sure it will stay with you for a lifetime! Take time to see all the history and love the land! Post new pictures on the Oranim sight! We need more than airport pics! Have fun! Lots of fun! Way to go Albert! All those chocolate sales have really paid off! Who needs Junior Achievement when you have SHA World’s Finest chocolate Sales? Thanks for the update, Rabbi Meyers! I was touched by the account of the Kiryat Malachi encounter with 8th graders, and that our kids did well trying to communicate. It sounds like you are getting some good eating in (food in Israel is SO GOOD), and having a “hard working,” very active trip. Will there be more pictures posted soon? I heard the very popular singing dua “The Rabbi’s (Meir, that is!) Sons” will be leading the group in great cheer Motsay Shabbat/L’ag B’Omer, with accompaniment from visiting guitarists Jeremy and Albert?!!! T’Valu! Have fun! A full Motza’ey Shabbat report – coming up! Shavua tov! Hello Rabbi Meyers and 8th graders! It was touching to read about your shabbat experience at the kotel. Thank you to Giselle’s parents and Jeremy’s Aunt and Uncle for hosting our kids. As we wind down for bed you are beginning your Sunday and we are hoping it will be a great one. Monday is the day we are especially excited about!! Hope you are all feeling great and enjoying every moment! Rabbi Meyers, we are praising you on a daily basis! looking forward to hearing about Saturday night! Hope it was a good time! In my last entry I wrote “T’valu!” But now I am thinking you are having SUCH a meaningful and fun experience….The 8th grade may not want to come back to Seattle! I have to thank everyone for welcoming our sons into this experience. It means so much to me that “Seattle” is getting to know our entire family! Thanks, Judy. Only, I would like to make one correction: I’m not writing the daily reports during my down-time. I feel that keeping you updated is an important component of each day. For this to be a real learning experience, I would like there to be follow-up between parent and child once the kids return to Seattle – and this will be made possible by “informed” parents who have “lived” the trip with their kids. Happy Lag Ba’omer! It sounds like you are all having a great time seeing and doing many wonderful things. I love reading about all your experiences. That is so cool that you were able to meet up with Rochelle. Did she remember everyone? Thank you so much Rabbi Meyers I loved seeing the pictures of your sons playing guitar with our kids. Enjoy!! Hi Marilyn we miss you here. We keep waiting for you to wake up and come upstairs for breakfast, then we remember you are in Israel. Have fun. Bring back kosher mentos for us. Hello ALL! Rabbi Meyers, We cannot thank you enough for the detailed postings! Your travels are on our mind day and night. in fact I wake at night and count the hours to think about what you guys are up to. I looked up in detail your three Sunday experiences online and imagine you all plunging into the falls at Ein Gedi after a day of meaningful hiking and floating! We spoke with Albert this morning and he has such excitement in his voice. He said he is loving every moment! Nothing could make us happier! Kids, we are proud of you for your participation in the Table to Table project and so excited for all of your experiences! I’m thrilled you saw Rochelle and family. I remember them well. Kids, take good care of Rabbi Meyers! I am just so impressed and excited by what our children are experiencing under the guidance of Rabbi Meyers. I am so impressed by Rabbi Meyers’ literary skills. Rabbi, you describe it all so well that I am able to picture all that you are sharing with us. Rabbi, Hazak U Baruch to you for the wonderful experience you are giving Albert and his classmates. Grandpa Albert, thank you for your excitement! The real credit for the trip goes to the students and their parents who made it a financially viable option by their fundraising efforts – and to the leadership of Rivy and Stephanie in the office, who made all practical arrangements. I am just reaping the benefits of their work. Keep on reading! 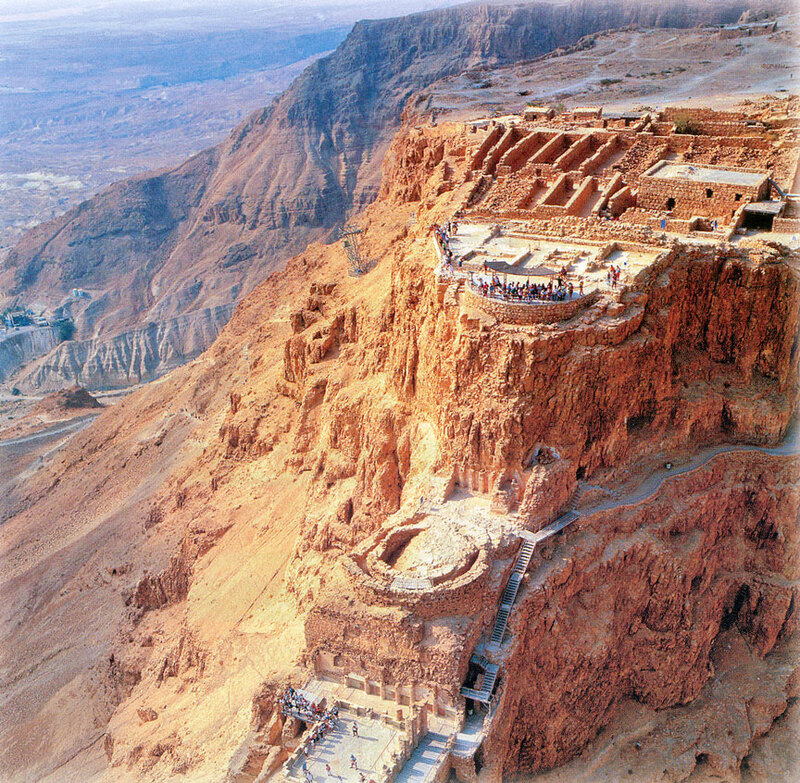 Today is Masada! Yoni (3rd grade) and Nity (K) enjoy reading the blog so much. They keep reminding me that this is what THEY will do when they get to 8th grade too. R Meyers, Thank YOU so much for making this experience such a “well rounded” experience for the entire group. I know that the whole school is reading this blog and excited at seeing how what they learn comes to life! Thank you SHA 8th grade parents for making this happen. What a great experience for all. Thanks, Bonnie! I think you said it best when you referred to the learning coming to life. Text, discussions, in short “book” learning only takes you so far….I know that I often have a hard time really picturing the events of ancient Jewish history….and deep down, don’t always appreciate that it all REALLY HAPPENED! Discovering the Roman nail in the dig yesterday was a highlight for me. Our trip here has been one big proof of all of the claims of our great books…in 3D! I’m hosting your family for a barbeque at my home for lag LaOmer. Libby is visiting with indie. I loved reading Rabbi Meyers’ blog about all of our adventures! As I write this you guys are waking up to start your day with a Masada hike, float in the Dead Sea and hike at Ein gedi! pretty spectacular. I am excited to see pictures and video when you return! Enjoy it all! Rabbi Meyers – Nina and Max were so excited to hear that Noah and Shaya were able to find a piece of pottery from the crusader time period! So excited, in fact, that they insisted we go to the same place today. We did and had a great time, thanks for the fantastic idea. We are really enjoying reading your blog and we look forward to seeing you on Shabbat again! How is your trip? We are reading all about the things you are doing. 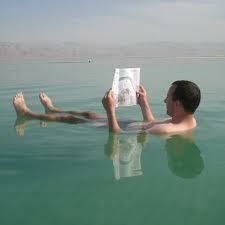 Was it fun floating on the Dead Sea? Did it hurt you at all? How is your new hotel? Are you swimming a lot? Did you put notes in the kotel? Five of us kindergartners spent Pesach in Israel. Did you meet other nice people there? Are you eating pita, Israeli salad, schwarma, halvah and falafel? Our Israeli students miss that food. We hope you will put some pictures up on the computer for us to see. Show the Dead Sea and the Masada pictures. I think it is so cool to find a 2000 years old nail and pottery. Living in the united States we forget how old the rest of the countries are. Also floating in the red sea must have been very interesting. It must have been effortless. It is not easy to be the minority, so rabbi I am with you about the experience at the Kotel when all different Jewish groups were praying together.What a wonderful feeling to be among your own, one of many like yourself. I am sure that was an amazing feeling for all of our kids. when I showed the archeaologist the nail, he said, “Oh yeah, you found a Roman nail..” as if it were an every day occurence! Hello Guys! I enjoyed viewing the pictures at the “dig”. The pictures really allowed me to understand the sifting process. I imagined it much differently. It was touching to see the group take out the torah atop Masada. We sure miss you guys here at SHA! We are all happy knowing that you are learning so much as you tour Israel. Keep the pictures coming! Rabbi Meyers, we truly appreciate the posts! Wow! what an amazing trip you are all having. Rabbi Meyers we never hear anything about the girl chaperon. Does she speak english? I was just curious I know you are busy taking care of all our kids. Thank you so much. This is a wonderful experience and I’m so excited for all of you! Keep having a great time and soak in every drop you can. I can hardly wait to see pictures and hear all about it! Wow! The food sounds delicious! especially shwarma! Enjoy! Hey All! I spent my morning ride to school chatting with Rabbi Meyers (With my Bluetooth of course! Mother’s day gift from Boy team) Sounds like the kids are doing exceptionally well. Rabbi Meyers is a Rock Star, keeping up with eleven active teenagers! Sending good thoughts your way and looking forward to a first hand account upon your return! I second the “Jewish Mother” request of drinking water and using sunscreen. I know visiting graves may not sound exciting but this is as close as one may come to the tangible aspect of hisatory and all great men and women of Jewish world. But I would like to know if it considered a mitzva? And does Hashem answer our prayers better if we pray at their grave side? If so why? I know in Persian culture we do this but I never knew why??!! Yikes!!! that is so crazy that you had all those ants in your date. What did the kids think? Did they find ants in there dates? The ants go marching on and on Hurrah! Hurrah! Rabbi Meyers, I am speaking on behalf of all the 8th grade parents as I thank you for spending this very special and meaningful time with our children. We all knew from the start that our sons and daughters were in good hands and that you would bring Israel to life for them, connecting them to their past and to their home Israel. I am definitely feeling a sense of bittersweet because I look forward to greeting all of you in Seattle but sad that your trip is coming to an end. We all wish you a shabbat shalom! Thank you to the Ginsburgs for hosting them twice for shabbat lunch! Thank you Ari and staff for your guidance. We will be thinking of you Friday and Shabbat and will see you all safe on Sunday night!